Singapore night-time street scene, with OUE building; taken August 2018. 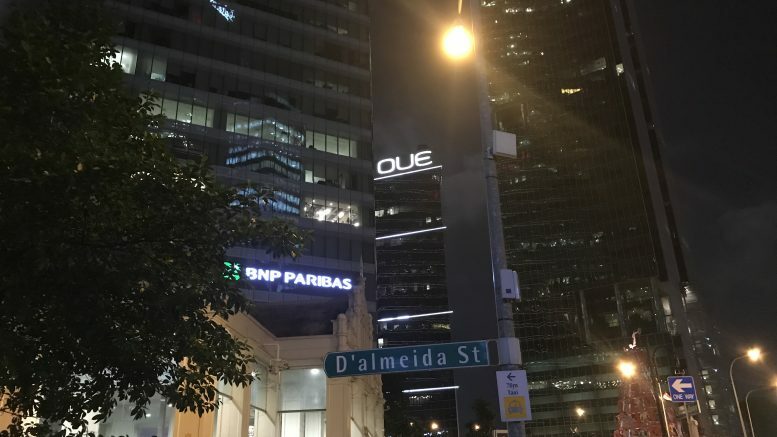 OUE reported on Friday that its third-quarter net profit fell 80.7 percent on-year to S$2.1 million, mainly on non-cash marked-to-market fair value losses of investments held at fair value. Earnings before interest and tax (EBIT) for the quarter ended 30 September rose 14.6 percent on-year to S$56.6 million, it said in a filing to SGX after the market close on Friday. Revenue for the quarter rose 0.8 percent on-year to S$183.3 million, on higher contributions from the hospitality and development property divisions, it said. Hospitality division revenue rose 6 percent on-year in the quarter to S$61.8 million on higher contribution from Oakwood Premier OUE Singapore, the serviced residences at OUE Downtown, which opened in June 2017, it said. The development property division’s revenue rose 13 percent on-year to S$43.6 million on the completion of sales of OUE Twin Peaks units sold under the deferred payment plans, OUE said. The healthcare division revenue was S$4.9 million in the quarter, dropping from S$11.3 million in the year-ago quarter, mainly on lower revenue from operations in China, OUE said. For the nine-month period, net profit fell 70.8 percent on-year to S$8.4 million, while revenue fell 15.2 percent on-year to S$479.6 million, OUE said.